Specific learning disability (SpLD) is a group of neurodevelopmental disorders which manifest in childhood as persistent difficulties in learning to efficiently read ("dyslexia" or “SpLD1"), write ("dysgraphia" or “SpLD2"), and/or perform mathematical calculations ("dyscalculia" or “SpLD3"), despite normal intelligence, conventional schooling, intact hearing and vision, and adequate motivation and sociocultural opportunity. Up to 5%–10% of “seemingly normal" school children have this hidden disability. Dyslexia affects 80% of all those identified as learning-disabled. The precise etiology of SpLD remains controversial but it is believed to be a result of functional problem with brain “wiring" rather than an anatomic problem and is genetically inherited. Brain single-photon emission computed tomography (SPECT) is a well-established and reliable method to assess brain function through measurement of regional cerebral blood flow (rCBF). We conducted this study to assess whether Indian students with newly diagnosed SpLD show any abnormalities in cerebral cortex perfusion. This study was approved by both the institutional ethics committees. The study protocol is registered with clinical trials registry of India (CTRI/2017/09/009757). An accompanying parent or legal guardian signed an informed consent form permitting participation of his or her offspring. In addition, all school students signed an assent form before enrolment. Confidentiality was maintained using unique identifiers. The present cross-sectional single-arm study was carried out jointly in two tertiary care hospitals in Mumbai, a megacity in western India from July 2013 to December 2014. Being a pilot study, no sample size calculations were made. The study population comprised students 8–18 years of age who were newly diagnosed with SpLD ("one or more of these three disabilities," namely, SpLD1 ± SpLD2 ± SpLD3). All students in the study group were right-handed and studying in English-medium schools situated in the city of Mumbai. Exclusion criteria were students with newly diagnosed SpLD who had a history of central nervous system (CNS) infection or comorbid epilepsy or those who were already on any medication for their comorbid ADHD. For each student, brain SPECT scan was done twice, with a minimum gap of 4 days between the two scans. Both scans were conducted with the student not having performed any academic activity, namely, reading, writing, or mathematics on that day prior to the scan. For the first or “baseline" scan, the student was made to sit with eyes open in a quiet, dimly lit room for a period of 30–40 min and then injected intravenously with 20 mCi of99m Tc labelled L, L-ethylcysteinate dimer (99m Tc-ECD), which has been widely used to study changes in relative rCBF using SPECT systems., This technique is called brain perfusion, and it relies on the coupled behaviour of blood flow and metabolism, which is used as a marker of neuronal activity., An hour later, the student was imaged on a dual-headed GE Infinia Hawkeye SPECT/CT. For the second or “test scan," the student was made to perform age-appropriate curriculum-based test under the supervision of the Special Educator for a period of 30–40 min to activate the areas in CNS related to reading, writing, and doing mathematical calculations. Subsequently, the student was injected intravenously with the same dose of ECD. Similarly, an hour later “test scan" was conducted. Initially, qualitative assessment using visual analysis was conducted to assess and compare cerebral cortex perfusion at rest ("baseline scan") and after activation ("test scan") in each student. Subsequently, quantitative assessment was performed using NeuroGam™ software (GE Medical System, Segami Corp., Columbia, MD, USA) to find out whether there were any statistically significant changes in the four different lobes – frontal, parietal, temporal, and occipital in both hemispheres [Figure 1]. NeuroGam statistical software for automated diagnosis of brain perfusion SPECT images uses an affine anatomical coregistration by blocks of data defined in Talairach space. It is used to investigate rCBF objectively and easily in cerebral lobes of left and right hemispheres. Qualitative assessment using visual analysis showed reduction in regional blood flow both in “baseline scans" and “test scans" in temporoparietal areas in all nine students [Table 1]a. However, when normalization was attempted and comparison was done by Talairach analysis using NeuroGam software, no statistically significant change in regional perfusion in temporoparietal areas was appreciated [Table 1]b. In the present pilot study, comprising a small series of students having newly diagnosed SpLD, visual analysis showed reduction in regional blood flow both in “baseline scans" and “test scans" in temporoparietal areas. However, on quantitative assessment statistically significant difference in cerebral perfusion could not be identified. To our knowledge, only one study by Arduini et al. from Brazil has reported brain SPECT scans in students with dyslexia. In their series of 34 students, they have done brain SPECT scans at rest and reported hypoperfusion on visual analysis in areas involved in reading and writing processes, namely, 80% had hypoperfusion in the temporal lobe, 20% had occipital hypoperfusion, and 10% had hypoperfusion in the frontal, parietal lobes, and cerebellum, respectively. Although our sample size is smaller, we have for the first time attempted quantitative assessment of brain perfusion in such students not only at rest but also after activating areas of learning. Conducting a similar study in a larger number of students with SpLD (with and without ADHD) may help identify areas of cerebral cortex having significant hypoperfusion indicating decreased neuronal activity. Brain SPECT scan is noninvasive, involves minimal radiation, and may serve as a robust tool to unravel etiopathogenesis of this invisible handicap. The authors wish to thank all the children who participated in this study and their parents. The Learning Disability Clinic at Seth G.S. Medical College & K.E.M. Hospital is partially funded by a research grant from Tata Interactive Systems, Mumbai. Sunil Karande is the Editor of the Journal of Postgraduate Medicine. Demonet JF, Taylor MJ, Chaix Y. Developmental dyslexia. Lancet 2004;363:1451-60. 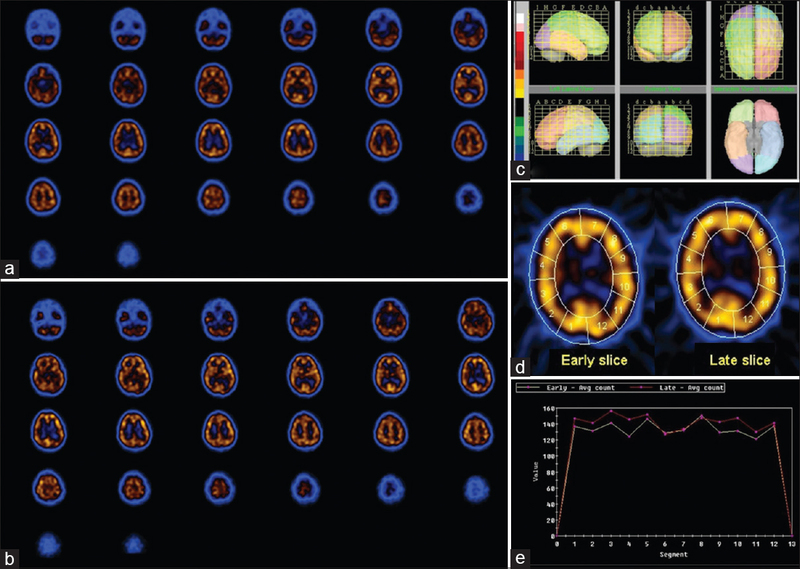 Santra A, Kumar R. Brain perfusion single photon emission computed tomography in major psychiatric disorders: From basics to clinical practice. Indian J Nucl Med 2014;29:210-21. Bhatt MC. Adaptation of the Wechsler intelligence scale for children for Gujarati population [Ph.D. dissertation]. Ahmedabad, India: University of Gujarat; 1971. Sholapurwala RF. Curriculum based test for educational evaluation of learning disability. 1st ed. Mumbai, India: Jenaz Printers; 2010. American Psychiatric Association (APA). Diagnostic and statistical manual of mental disorders. 4th e. Revised. Washington, DC: APA; 2000. Willcutt EG, Pennington BF. Comorbidity of reading disability and attention-deficit/hyperactivity disorder: Differences by gender and subtype. J Learn Disabil 2000;33:179-91. Karande S, Doshi B, Thadhani A, Sholapurwala R. Profile of children with poor school performance in Mumbai. Indian Pediatr 2013;50:427. Marroni BJ, Marroni SP, Mayer CM, Braga BR. Diagnostic use of neuro-spect quantified with99m Tc-ECD - A model based on normal data. Dement Neuropsychol 2013;7:416-23. Fu P, Zhang F, Gao J, Jing J, Pan L, Li D, et al. NeuroGam software analysis in epilepsy diagnosis using 99mTc-ECD brain perfusion SPECT imaging. Med Sci Monit 2015;21:2801-8. Lee JS, Kim BN, Kang E, Lee DS, Kim YK, Chung JK, et al. Regional cerebral blood flow in children with attention deficit hyperactivity disorder: Comparison before and after methylphenidate treatment. Hum Brain Mapp 2005;24:157-64. Cherkasova MV, Hechtman L. Neuroimaging in attention-deficit hyperactivity disorder: Beyond the frontostriatal circuitry. Can J Psychiatry 2009;54:651-64. Mayes SD, Calhoun SL, Crowell EW. Learning disabilities and ADHD: Overlapping spectrum disorders. J Learn Disabil 2000;33:417-24. Gilger JW, Kaplan BJ. Atypical brain development: A conceptual framework for understanding developmental learning disabilities. Dev Neuropsychol 2001;20:465-81. Kaplan BJ, Dewey DM, Crawford SG, Wilson BN. The term comorbidity is of questionable value in reference to developmental disorders: Data and theory. J Learn Disabil 2001;34:555-65. Juni JE, Waxman AD, Devous MD Sr, Tikofsky RS, Ichise M, Van Heertum RL, et al. Society for Nuclear Medicine. Procedure guideline for brain perfusion SPECT using (99m) Tc radiopharmaceuticals 3.0. J Nucl Med Technol 2009;37:191-5.